Honda has announce the Xtreme Academy UK training day will take place at Thoresway Honda Motoparc near Caistor, Lincolnshire on 15 August 2012. The training event, which forms part of Honda Europe’s initiative to nurture and support young talent, will see current Honda World Motocross Riders, Evgeny Bobryshev and Rui Gonçalves join former Grand Prix winner and Xtreme Academy trainer, Brian Jorgensen, at this special coaching event exclusively available to all Honda riders aged under 23 years-old. Prior to the British Grand Prix, the GP stars will make a special trip to work with the Honda youngsters, and those riding the CRF150R machine. The day will include lunch and is available to riders of all ages and abilities at the hardpack track based in Lincolnshire. The Honda Xtreme Academy is currently operating as a separate championship within the main national big wheel series in five countries this year, with special events in a further three nations offering many benefits to Honda riders. 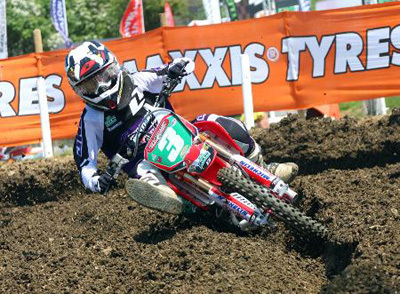 In the UK, past Academy winners Adam Sterry and Brad Todd have gone on to race their machines successfully in the youth and adult British championships, while the 2012 championship is being led by Josh Gilbert with three rounds to go. The cost is £40 per rider and the first three people that confirm their entry for the day will receive a signed replica race jersey almost identical to those worn by Bobryshev and Gonçalves on track. To register, please email info[at]revracing.co.uk and provide rider’s name, age, date of birth, parents name (if under 18) with phone number, address, email address, and specify machine. Entries will close on 6 August and are available on a strictly limited first come, first served basis. Sign up now to avoid disappointment! For more information on the Honda Xtreme Academy, visit hondaproracing.com/xtreme-academy. If you want to know more about the Honda CRF150R, visit honda.co.uk or your local Honda Motorcycle dealer.